We are introducing some special "One Club" offers which we know will be popular with collectors and supporters of the individual club(s) featured. This page will be devoted to a collection of 10 different ARSENAL covers all official issues which have been produced over the years and give a snapshot of some of the most memorable occasions in the club's recent history. Included is the first Official Football Cover in the series when Arsenal won the League and F.A. Cup "Double" back in 1971. It was issued on the date the "Gunners" played their first home match of the season in Europe. 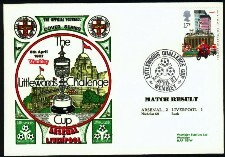 Other covers include their Centenary cover issued in 1986, their Littlewoods Cup Final cover issued in 1987 when they beat Liverpool 2-1 at Wembley and the European Cup Winners' Cup Final when they beat Parma in Copenhagen. This cover was stamped and postmarked in Copenhagen. The rest of the collection of ten covers is made up with interesting matches in Europe, against Spurs and is an ideal starter to buld up your own "Postal History" of Arsenal FC. These can be collected in put in albums or framed for all your friends to see - for much less than you may pay for just one picture! The entire collection included post, packing and insurance is offered for just £45!